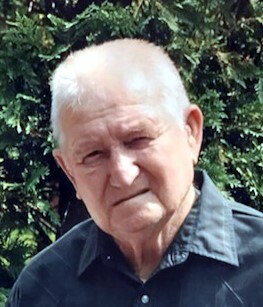 Richard Lee Fenton, 84, of Quincy, passed away Tuesday (January 15, 2019) in Blessing Hosptial. Born November11, 1934 in Marcelline, Illinois, Richard was a son of Charles and Marguerite Heaney Fenton. He married Colene Maggart on August 30, 1958 in New London, Missouri. Richard was a member of the International Association of Machinist and Aeorspace Workers Lodge No. 822 and the Fraternal Order of Eagles. He enjoyed his weekend camping trips to Whispering Oaks Campground where he drove his golf cart all over to socialize. Richard was an avid race fan, watching many late model and dirt track races and watching Nascar where he was a huge Kyle Busch fan. Mr. Fenton was employed at Knapheide Manufacturing as a painter for 32 years, retiring in 1996. Following his retirement, Richard worked part time at Quincy Machine and Welding for several years. Survivors include his wife, Colene, five children, Randy Fenton (Donna Walbring) of Quincy, Debbie Lung (Gary) of St. Charles, MO, Cheri Fenton of St. Charles, MO, Rick Fenton of Quincy and Eddie Fenton of Quincy; four grandchildren, Jeanna Schwindeler of Quincy, Dalton Lung, Dillon Lung and Devon Lung all of St. Charles, MO; four step grandchildren, Heidi Menke (Martin), Nikki Ripley (Will), Natalie Budde (Shamus) and Sean Lung (Christy); one great grandchild, Connor Schwindeler; six step great grandchildren, Miles Menke, Alexandra Ripley, Olive Budde, Ruby Budde, Nolan Lung and Mady Lung; two brothers, Larry E. Fenton and Jim Fenton both of Quincy; and many loving nieces and nephews. Mr. Fenton was preceded in death by his parents; seven sisters, Frankie Seals, Betty Caine, Judy McGlothlin, Rosie Hayes, Connie Hoener, Bessie Christ and Mary Hankins; and two brothers, Bob Fenton and Bill Fenton. Funeral services will be held Friday morning at 10:30 in the Zehender Robinson Stormer Cookson Funeral Home with Pastor Kory Hollensteiner officiating. Burial will be in Greenmount Cemetery. Visitation will be Thursday evening from 4:00 to 7:00 and Friday morning from 10:00 until the time of services at the funeral home. Memorials may be made to the Blessing Cancer Center.